So here it is. Don't lie, you've been impatiently waiting for this all year, too. The (what can only be described as) epic marriage between two of the world's finest experimental entities, namely Chapel Hill, North Carolina's blackened psychedelic monster Horseback and obscure Texas acid post-rock entity Pyramids. After what was initially supposed to be just a 2x7" split + collaboration, ISIS/House of Low Culture mastermind Aaron Turner and his wife, Mamiffer's Faith Coloccia, added just enough "awesome" (and enough time to make it an LP + 7") to make A Throne Without A King one of the most intriguing releases of 2011. Did I drop enough names to get your attention? 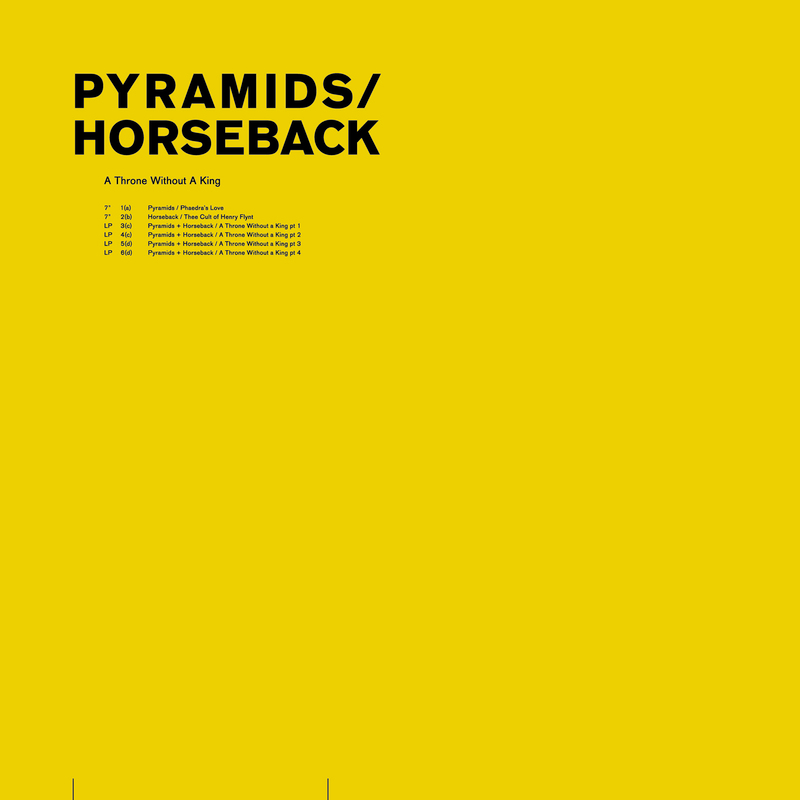 Part I: Horseback/Pyramids Split 7"
Opening with a split between the two artists, a canary yellow 7" displays both Horseback and Pyramids's most experimental, bizarre sides yet. A-side monster "Thee Cult of Henry Flynt," named for one of the most pessimistic philosophers to grace this Earth, grips the listener in a vice of screeching, frozen black metal, only to drop him into a vast tundra of, you guessed it, ice and fog. 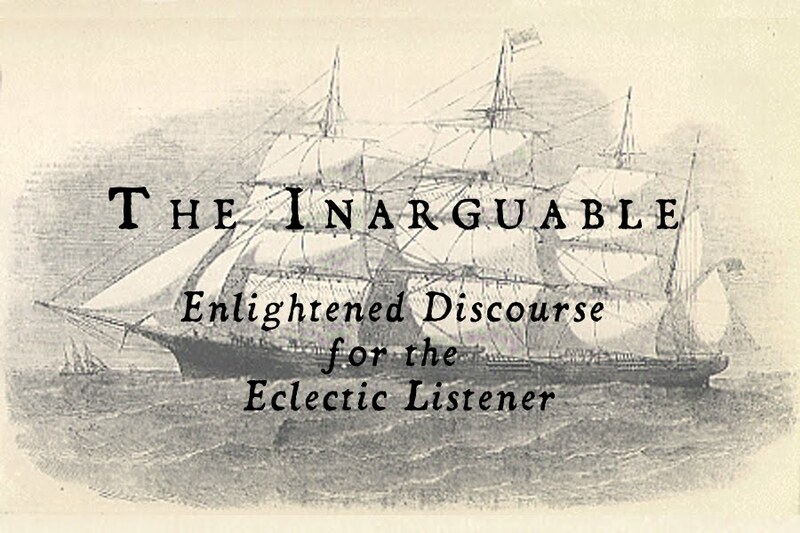 Though "Thee Cult"'s introduction might elicit comparisons to bands like Krallice, mainman Jenks Miller's immense creativity still sets aside yet again, making sure to crane necks with each new development. After an initial explosion of caustic, free-drums, Pyramids's "Phaedra's Love" descends into a beautiful-yet-offsetting world of bowed glass and chimes, ebbing and flowing between curious dissonance and ethereal, harmonic grace. Glorious, hidden voices and mysterious piano dance about the crystal landscape, only to be disrupted by charging, industrial drums. It is beautiful. It is destructive. 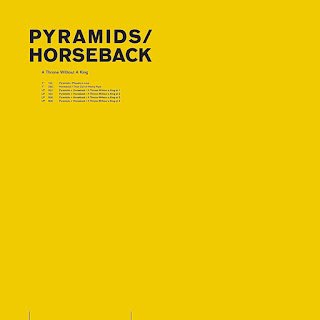 Neither Pyramids nor Horseback can disappoint. Approaching collaborations is a difficult task, especially if you've grown fond of both contributing entities. There are so many things that you would want these artists to do, but you can't really...expect anything. Maybe those artists had something else in mind. Collaborations are there to break the mold and help artists grow from one another's influence, after all. A Throne Without A King is one of those collaborations. You won't hear Horseback's groovy, blackened space rock or Pyramids's jilted, black-metal-by-way-of-post-rock romance, but that doesn't necessarily mean it's bad. Together we see these artists coming together to create something that might be more in tune with the works of, say, post-industrial wizard Steven Stapleton or drone monolith Gas. Backed with punctuated, treated recordings of kitchenware percussion and heralded by ominous voice cuts, A Throne Without A King is definitely more of a noise or drone album which, as weird is it is to say, didn't really do much for me on the first listen...BUT, with each new listen, more wondrous subtleties emerged from the unfamiliar, glassy landscape. It's those subtleties on which this collaboration is built, and it's those subtleties that make this collaboration something to behold. The quiet, intonated feedback that hides just behind walls of calming noise, or the deep, almost inaudible, welling, omnipresent bass. Some people might say that progressive rock is the thinking man's music, but this...this really makes me think.